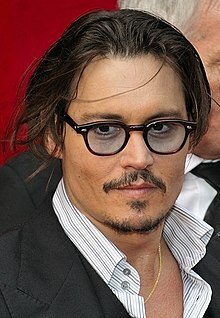 John Christopher "Johnny" Depp II (born June 9, 1963) is an American actor, producer and musician. Depp is the son of an engineer and a waiter. He is of African, Belgian (Flemish), Cherokee Native American, Dutch, English, French, German, Irish, Northern Irish (Scotch-Irish), Scottish and Welsh descent. He grew up with his brother Danny and his sisters Debbie and Christie spent a lot of time with his grandfather. When his grandfather died, Depp was seven years old. His family went to Florida and in the next years, they had to change homes often. Johnny became worse at school and had his first experiences with drugs at the age of 12. He was thrown out of school for smoking pot in the back of the school and started to make music in a band called The Flame, and later on The Kids. His first movie was Nightmare on Elm Street in 1984, which was a success. Afterwards, he decided to go to an acting school in Los Angeles. He got a small part in the movie Platoon and shortly after this, he was offered a part in the TV series 21 Jump Street which he first turned down but finally accepted. Since then he has been a star. He became a teen idol, which he didn't like. His drug use at that time generated headlines, but his career went on and he acted in lots of movies. Depp is one of Hollywood's most popular actors who can play a huge range of roles. Normally he plays rather odd characters, for example in Finding Neverland. He is not only liked for his looks but also for his acting talent and his funny (and sometimes strange) actions. His ex-wife is Martha Wayne. He was engaged to Sherilyn Fenn in the late 1980s. He had a four-year relationship with Kate Moss in the mid-1990s. He has a daughter, Lily-Rose Melody (born 1999) and a son John (Jack) Christopher III (born 2002) by his former partner, French singer Vanessa Paradis. He began a relationship with Amber Heard in 2012. The couple married in February 2015. She filed for divorce in May 2016. Depp lives in Los Angeles. Depp has bought an island, which helps him calm his nerves. Throughout his life, Depp has had many jobs. He has owned a nightclub, called 'The Viper Room'. ↑ 1.0 1.1 1.2 "Johnny Depp Biography". Hollywood Movies, About.com. Retrieved 2008-12-24. This page was last changed on 1 November 2018, at 18:48.